When I first moved to Denver in 2008, the effects of the recession on the state and its residents were clear, and it was a prominent topic of conversation in the legislature and among advocates. Resources were very limited and the needs of residents had increased. Fast-forward a few years, and the landscape and forecast have begun to improve. The state government is seeing more revenue than in the last few budget cycles, and the economy is rebounding with obvious signs of new growth. Colorado is a destination relocation state, with the population estimated to reach 6 million by 2020. It has been an exciting few years, but not everyone has not been able to take advantage of these new opportunities. Inequality of opportunity can have a significant impact on our ability to achieve our lofty goals for Colorado, especially the strength of our economy and the health of all Coloradans. Income and economic opportunity are inextricably tied to a person’s ability to attain and maintain good health. CCMU has demonstrated this connection in several ways: our Health & Income Issue Brief, our Action for Equity – Income Brief, and our Art of Health Care Video. Reviewing key data, it is clear that income determines a person’s ability to get and stay healthy, to seek out what they need from the health care system, and to live and work in healthy places. A person’s income is determined by where they live, their educational attainment, and job availability. To address these factors and improve Coloradans’ financial stability, we must develop the infrastructure to create economic opportunities for individuals and families to move out of poverty, as well as supports for those moving along that continuum or struggling more than others. Creating quality affordable and mixed-income housing is one such example with proven outcomes. HB 1017 (PDF) passed in this most recent session, encouraging development of mixed income housing units and affordable housing units through tax credits and public-private partnerships. 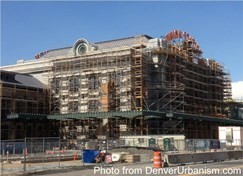 Union Station will soon have brand-new affordable housing units, which will allow low-income Coloradans to pursue jobs and education opportunities close to the urban center. Amidst all the growth, we will need to ensure we don’t leave some Coloradans behind. In some ways, we’re getting it right, but we need to challenge ourselves to do better in other ways and to ensure these opportunities are made available around the state. In the coming years, I look forward to seeing Colorado’s continued ascent as one of the most exciting and vibrant places in the country. I believe we can be one of the richest in opportunities for all and truly achieve the best state of health.